On Two Wheels: To Tyniec, and Beyond! If you live in Krakow, love cycling and aren’t going to get a holiday this year, there is a ready-made weekend escape route. The Trasa Tyniecka (the Tyniec Route) stretches from downtown Krakow to Tyniec Abbey, some six miles west of Wawel Castle. And if you have cycling friends in Warsaw, invite them too – you can cycle from the railway station platform all the way to the end of the route with ease (take the ramp at the northern end of the platform down to a cycle track in a tunnel – turn right to get to Rondo Mogilskie and the Kotlarski Bridge). 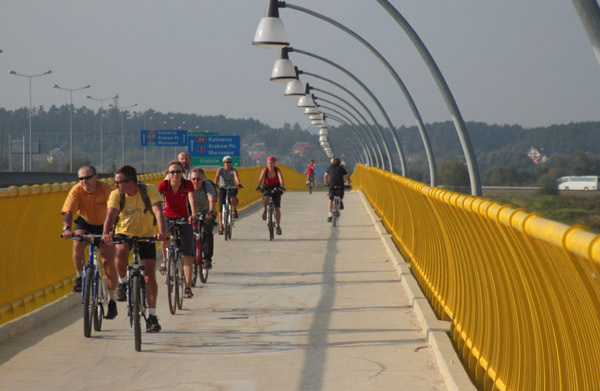 Trasa Tyniecka, opened in 2004, has become extremely popular with recreational cyclists. 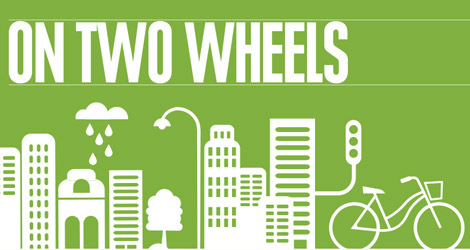 A traffic study conducted a few years ago found more than 600 bicycles passing per hour at peak time on sunny summer weekends. It is easily accessible from many parts of Krakow – you just need just to reach the south bank of the river and then head westward. Running along the top of flood levees, the route is almost completely paved, flat and car free. There is just one gap that forces you to either cycle along a road for a few hundred metres among cars, or go off road along an unpaved track by the river. This can be very muddy after rain, or underwater if the river is high. Unfortunately, this gap in the route is not going to be filled any time soon, thanks to a legal dispute between the municipality and landowners. Since it was impossible to build the cycle track on top of the levee here, because it passes very close to houses, it was supposed to run in front of the levee, closer to the river. The landowners said ‘no’ (or perhaps ‘not enough’) and the project was scrapped. Before you reach Tyniec Abbey, with its nice cafe and restaurants (closing time is a bit early, at 7pm) you can stop and watch the whitewater kayaking at the Kolna facility next to the motorway bridge. There is also a paintball field and an indoor swimming pool here. There are open air pubs in Tyniec by the river, and a few cafes before you get that far, although they are not very savvy about advertising to passing cyclists. To get to the Abbey from Kolna, you need to cycle under the motorway bridge and navigate a steep but short stretch of dirt track up and over the levee. On the other side, the very pretty and almost car-free ul. Promowa leads all the way to Tyniec. There are no signs here – just follow the crowd. Alongside the bridge that carries the motorway over the river at Kolna is Poland’s longest cycle bridge (almost 300 metres). 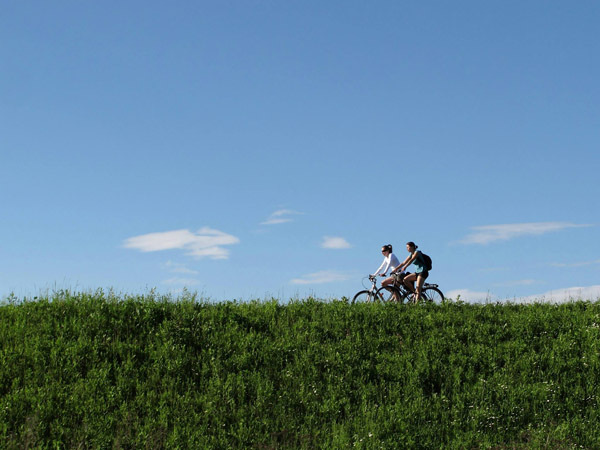 It connects the Tyniec Route with a new cycle track on the northern bank of the river that leads you all the way back to the Zwierzyniecki Bridge. Since the street between the Zwierzyniecki Bridge and Salwator has a bus lane that is closed to cyclists (we must use the middle lane), it is advisable to cross the bridge (on the separate cycle path) and return to the Trasa Tyniecka. The ride to Tyniec is enough for many, but there are several options leading from the route if you want to go further. After crossing the cycle bridge at Kolna, you can follow the levees along the Sanka River just next to the motorway exit to reach Kryspinów Lake – a popular swimming resort for many Cracovians. Unfortunately, the route is not signposted and little known, so you should do some research with Google Maps before the trip. It is perfectly possible to continue cycling west of Tyniec Abbey along the levees. The route is neither paved nor signposted, but a map and some intuition will get you to Skawina and then to Kopanka, where there is an old-fashioned river ferry (daytime only). If you’re feeling particularly energetic, you can continue to Wadowice or Oświęcim (Auschwitz). The route is signposted as Wiślana Trasa Rowerowa. It is flat and mostly paved (with a few gravel stretches). Signage is poor, however, so make sure you have a good map. About half way are the Stawy Zatorskie (Zator Fish Lakes), renowned as much for the birds as the fish. Birdwatchers will also appreciate the bird sanctuary next to the Łączany Dam on the left bank. The ride to Oświęcim is roughly 80 km. Trains from Oświęcim back to Krakow accept bikes (you need to buy extra ticket), but are very slow (2 hrs) and the last one leaves at 20:28. For the really ambitious, the Oświęcim route is the first stage on the way to Vienna. I did it this year and recommend Pszczyna as the first night stop and Zebrzydowice / Petrovice u Karvine as the perfect border crossing. The Czech Republic is definitely more cycle friendly than Poland, and a nice cycle track starts right at the border. Perhaps it’s not a good idea to go that far – you might decide to never come back.